Tie the straps in a square knot (not a bow). For your comfort ensure baby’s weight is not hanging away from you because the carrier is too loose (make sure there is no gap between your body and baby’s body). Don't forget to give a little bounce before tying the straps. This bounces the baby deeper into the carrier giving a better seat. Baby should be seated with knees higher than bum. 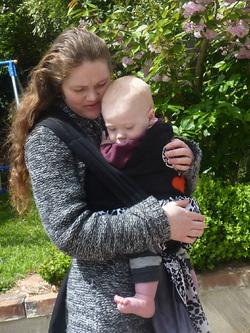 If you find the sling uncomfortable after a short time ensure you are wearing your baby high and tight, so the baby’s feels like a part of your own weight and is not hanging away from you, with the rings in a ‘corsage’ position at your collarbone. You will want to have them fairly high for long-term comfort. The bottom rail of the sling should fall around waist level. 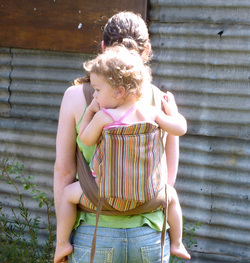 Ensue that the sling is spread evenly across your back, is not twisted and that the tail is threaded evenly through the rings so you can adjust all parts of the sling pouch evenly for a good fit. It is a good ideas to get used to wearing the sling on either shoulder so you can switch shoulder easily if one shoulder gets tired. Tie fairly tightly so your baby's weight is held against you. If there is any slack in your podaegi you will become uncomfortable quickly. Check your straps are spread out. If necessary you can pull on the top edge of the carrier to make the 'pouch' deeper. Inspect your carrier before each use and don't use if there are signs of wear. Before first use read all instructions. Practice with a doll or teddy before trying with baby over a soft surface or with a helper. 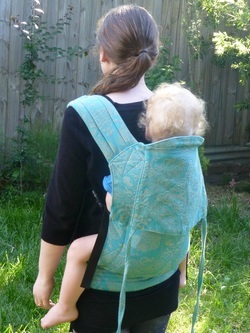 Use common sense when using your baby carrier, and avoid any activities that will shake or put your baby in danger, e.g. jogging, bike riding, hot drinks, cooking. Don’t use the carrier for anything you wouldn’t do with baby in your arms. Always check your baby’s airways are clear. Don't leave a baby wrapped in a sling to sleep as they could become entangled in the fabric. 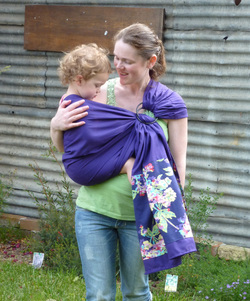 There are some important safety issues for young babies in a cradle carry in a ring sling. Baby should not be curled chin to chest as this can restrict baby’s airway. You should be able to fit two fingers under baby’s chin. There should by no sling fabric over baby’s face and baby should be positioned so baby’s body is not rolled against you – make sure her face is not pressed against your body. Babies should face upward, unless breastfeeding and in that case be aware of your baby’s airway.